Omega Horseshine® is all natural and literally create a lustrous shine of health that is striking! At less than 30 cents a daily serving, you can’t go wrong! "My name is Sean Moriarty and I have the privilege, along with my wife Brenda, of owning and operating Omega Fields. Maybe your experience in today's business world has been something like ours: sales people with little or no knowledge of their products, disinterested service providers, business owners telling you anything to get the sale and then disappearing when you need additional service or, God forbid, a refund! We are confident you'll love our products and we are determined to make your experience with Omega Fields a pleasant one. Whether you use our online ordering process, call our toll free order line or find our products at your local retailer, we want you to be able to enthusiastically recommend Omega Fields to your friends. As the manufacturer, product quality is our number one priority, as a product retailer, YOU are our number one priority. We promise to do everything possible to make your experience with Omega Fields positively memorable. Thank you for your business." The Omega-3 stabilized ground flax seed supplement - made with stabilized, freshly milled, food grade flax - to help maintain a shiny healthy coat, strong solid hooves, and top performance - for horses in all life stages. Omega Fields provides the best stabilized ground flax that is stabilized using our proprietary flax stabilization technology. Dry scaly itchy skin, joint pain/inflammation, poor hoof growth, allergies, pregnancy*, etc. may indicate a deficiency of Omega-3 essential fatty acids in the diet. To overcome these deficiencies the horse may need to get an increased serving size (up to 2 to 3 cups) of Omega Horseshine® every day, short term. *Pregnancy is a condition associated with Omega-3 deficiency because of the foal’s fast-growing brain, eye, and organ cell use up all available Omega-3s from the mare. Manufacturing quality is inspected through the American Institute of Baking (AIB). This program establishes a standard for consistency in food plant operations and food industry safety. Lynn Palm recommends Omega Horseshine® and Omega Nibblers® for all of her horses! Rafael Valle (Owner of Ivory Pal – Omega Horseshine® Ambassador) loves Omega Horseshine® and Omega Nibblers®! Available in a 4.5 lb pouch (approximately one-month supply), a 20 lb bag (approximately three-month supply), and 50 lb bag (approximately eight-month supply). Stabilized Ground Flax Seed, Yeast Culture (Diamond V Yeast), Ground Oats, Calcium Carbonate, Zinc Sulfate, Sodium Selenite, Copper Sulfate, Folic Acid, Niacinamide, Manganese Sulfate, Calcium Pantothenate, Pyridoxine Hydrochloride (Vitamin B-6), Biotin, Vitamin B-12 Supplement, Riboflavin and Thiamine. Feed ½ to 1 standard measuring cup daily, top dressed over feed, for 1000 to 1200 lb horse (adjust amount proportionally up or down per weight of horse; ie. ¼ to ½ cup for 500 lb to 700 lb horse and 3/4 to 1-1/2 cups for a 1700 lb to 2000 lb horse). Start gradually to suggested minimum daily serving of ½ cup: 1/8 cup on first and second days, ¼ cup on third and fourth days, then1/2 cup on fifth day. Thereafter, increase as desired. Short term upload amount is 1 cup to 3 cups daily for 1000 to 1200 lb horse (adjust upload amount proportionally up or down per weight of horse). The stabilized, ground, fortified flax seed used in Omega Horseshine® utilizes proprietary stabilization technology developed by ENRECO®, INC. (Omega Fields' parent company). The powerful nutrients in Omega Horseshine® are locked in and guaranteed stable for at least 12 months with no signs of rancidity or loss of nutritional value. Best if stored in a cool, dry place. The friendly and knowledgeable people at Omega Fields® are always happy to receive calls and emails. For your convenience, many frequently asked questions are available on our website so that you can get even faster answers to commonly asked questions! What About Omega-3 Rich Flax For Me? At Omega Fields®, we offer two great options to receive the benefits of Omega-3 your body needs! If you want just the flax, you can try our Simply Omega-3. It is loaded with fiber, antioxidants, and Omega-3 fatty acids to keep you living a simply healthy lifestyle! Or you can try our Mega Omega® a balanced nutritional supplement with stabilized flaxseed base, plus oat bran -- fortified with a vitamin and mineral formula containing excellent levels of Vitamins D-3, C & E, and Choline – for people seeking a healthier lifestyle! What About Omega-3 Rich Flax For My Dogs? Our all-natural, ground, stabilized flaxseed, rich in Omega-3, works at the cellular level to help your dogs maintain healthy skin and coat, and top performance in all life stages! We offer Omega Canine Shine®, our Omega-3 supplement made with ground flax and fish oil or Omega Nuggets, an Omega-3 healthy TREAT supplement made with flax and fish oil your canine companions will love! Omega Canine Shine™ and Omega Nuggets both work to help reduce shedding, eliminate hot spots, support digestive and urinary tract health, boost the immune system, sustain proper growth and development of the nervous system, strengthen bones and teeth, relieve arthritis pain and promote joint mobility, increase energy levels and is vital in the structure of cell membranes. Try our premium products for your canine companions today! Ordering is easy! You have several options to order Omega Fields® premium products! You are welcome to order on our toll free line (877-663-4203), or go to your local store, now carrying our products! We have dealers throughout the country! 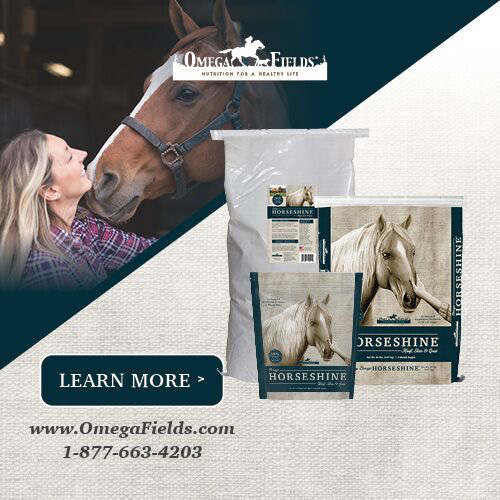 And for your convenience, Omega Fields® products can be found at SmartPakEquine, ValleyVet, many retailers and more. Just call us today!